I love Jennifer Estep. I have since I read her first Elemental Assassin novel, which was pretty damn awesome. 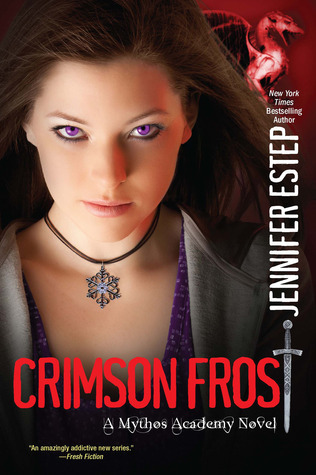 I fell in love with Gwen when I picked up the first Mythos Academy book, so I was pretty friggin excited when I saw Crimson Frost on Netgalley. So excited, I squealed. I never squeal. This fourth installment starts with Gwen and Logan on their first date, finally! Everything’s going great, or as great as it can be when Gwen’s involved. The girl is a total klutz but she’s endearing. The moment you think she finally caught a break, members of the Protectorate burst into the coffee shop and arrest her on some pretty crazy charges: being an accomplice in the murder of all those Mythos kids and intentionally freeing Loki, the God of Chaos. To make matters worse, two of the judges who’ll be at her trial are Logan’s parents, the other two are positive she’s guilty, the guy tasked with shadowing her, Alexei, couldn’t care less about her AND they’ve got an eye-witness, most surprisingly. All of the characters I loved in the previous books are back in this one, too. Daphne, with her quick temper and pink magic; Vic, the awesome, yet annoying talking sword; Morgan, Oliver, Logan, of course. Alexei, the young Protectorate trainee tasked with following Gwen around, is an interesting addition and a pretty great character. Serious, composed, deadly. It seems he’ll be in the fifth novel as well and I’m glad. However, all secondary characters felt a bit flat in this read, mostly because Crimson Frost is focused more on Gwen taking matters into her own hands and getting herself out of trouble, since no one else seems able to do it. There are enough character interactions, and very sweet moments between Gwen and Logan, that I was able to overlook this issue. The setting is the same as it was in the previous novels, with most of the plot developing inside the Mythos Academy because Gwen is permitted to stay until the trial. This means the whole student body knows of the accusations brought against her and they’re not afraid to tell her what they think. All the shunning, the personal attacks, the violence, made me feel really bad for Gwen and, in consequence, like her even more, especially since she handles everything pretty well. The writing is excellent: polished and well structured. There are some pretty creepy scenes involving the statues on the property, the reaper fights are superbly written – so exciting; much more dinamic, dangerous and dark than before. Also, her trial? It’s so barbaric, it’s awesome! Great details, interesting and new ideas. Furthermore, there’s the element of surprise. While some parts of the ending I did expect, some were total surprises. You won’t guess who the bad guy is, neither will you guess the evil plan set in motion, until Estep tells you. The only other problems I had with Crimson Frost, besides the issues with the characters, were the pacing – it was uneven and the plot dragged a bit – and too much telling instead of showing. I’m perfectly capable of drawing my own conclusions, even more so when they’re blatantly obvious, without an author making her character say “See!? This is it, this is the explanation of what just happened!!!”. No kidding, Captain Obvious. So, why did I rate this a 4 out of 5? Well, because, Gwen is not your usual YA heroine and I LOVE that. She might be Nike’s champion but, in this world of warrior kids, she’s not that special. No ah-mazing fighting skills, no almighty powers, no out of this world wit, nada. She’s not speshal like most YA MC’s are. Yet she’s a very strong, very tough character. You really get to see that, in this novel more than the others, at the end of the book. Overall, I really liked this. Can’t wait for the next book, I must see some more of Logan, dammit!